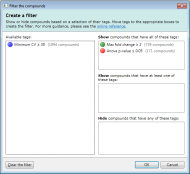 Summary: In Progenesis QI, tags can be used to categorise compounds. The compounds can then be filtered according to their tags, giving you a simple means of concentrating on the data of interest. 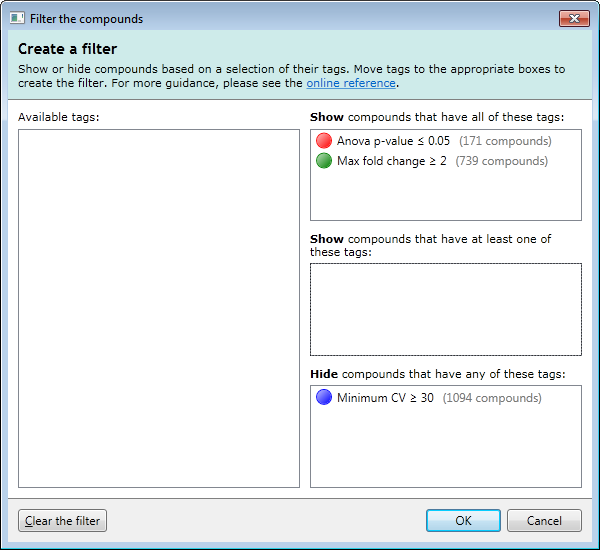 Tags are one of the most flexible analysis tools in Progenesis, allowing you to attach a label to a selection of compounds. 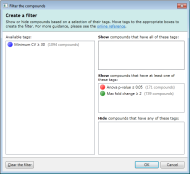 You can then show or hide compounds using a filter that's based on a selection of their tags. To create a tag for the selected compounds, first select the compounds to which you want to apply the tag. Compounds can be selected in the list at the left of the screen. To select a range of compounds, you can click the compound at the start of the range, then hold down the Shift key and click the compound at the end of the range. To select or deselect an individual compound, hold down the Ctrl key and click on it in the list. Enter the name that you want to give the tag. If you'd like it to have a different colour, click the coloured button to the left of the name. When happy, click OK. The tag is created and each of the selected compounds is given that tag. If any compounds already had a tag, the new tag is applied in addition to the existing tags. Using the QuickTags feature, certain types of tag can be created without first having to select compounds. 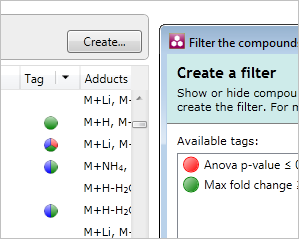 For example, you can quickly tag all compounds with a p-value of less than 0.05. 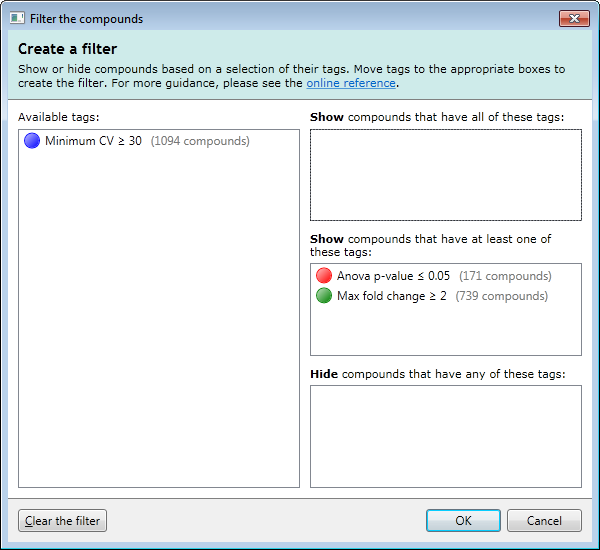 To use QuickTags, right-click anywhere in the list of compounds. 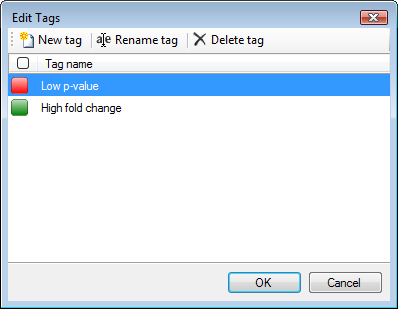 In the tag menu, open the Quick Tags sub-menu and select one of the options in it. As before, the Create New Tag window will appear. Enter a name for the new tag and, optionally, choose a colour, then click OK. 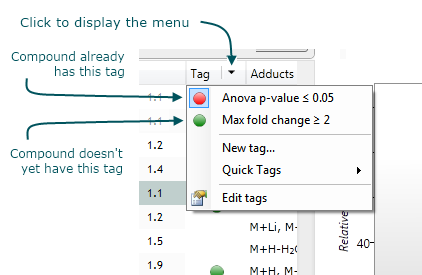 This time, the new tag will be applied to all compounds that meet the criterion selected in the Quick Tags menu. Note: if your compound measurements change, this tag will not be recalculated. That is, all compounds that were assigned the tag when it was first created will continue to have that tag, regardless of their new measurements. Either method will display the tag menu. From that, simply select the tag you wish to apply or remove. 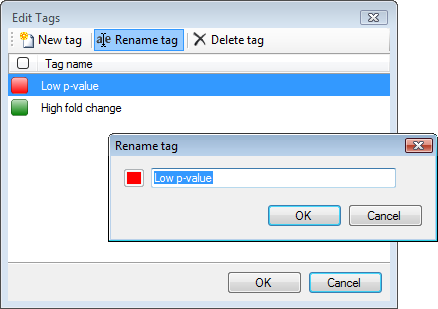 To rename a tag, highlight it and click Rename tag to show the Rename Tag window. To delete a tag, highlight it and click Delete tag. Note that this will remove the tag from all compounds, not just the selected compounds. 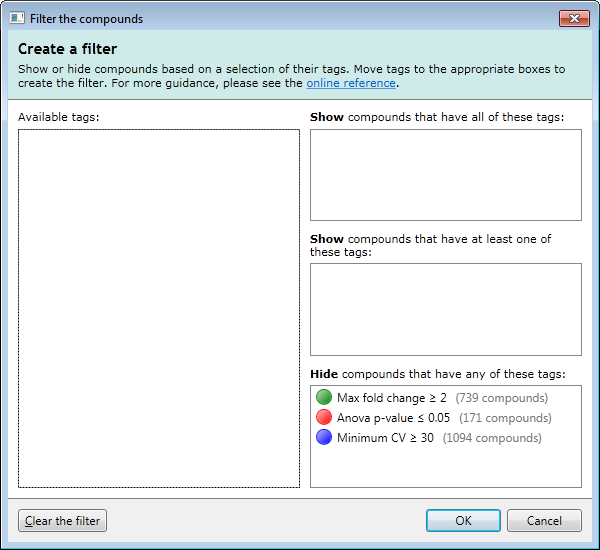 While labelling your compounds with tags is a helpful way to organize your data, filtering based on those tags is the more powerful analysis tool. By creating a filter, you can quickly reduce the amount of data you are viewing, enabling you to concentrate on the compounds of real interest. Only compounds that have both of these tags will be shown when you click OK. All other compounds will be hidden. Any tags left in the Available tags list will not affect the filter. 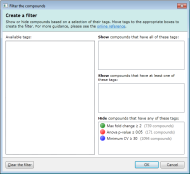 Finally, to return to showing all compounds, just click the Clear the filter button and click OK.